Jacqueline is a pivotal part of the team and her excellent customer service and eye for detail benefitted clubs and organisations involved in the application and delivery of the Sportivate programme. Since Sportivate her new role involves developing relationships with organisations, exploring new income investment initiatives and assessing the feasibility of these to drive up levels of sport and physical activity across the county. Jacqueline’s work also includes supporting clubs including promotion of Sport England’s Club Matters programme. Prior to joining the team, Jacqueline worked for 13 years as an artwork manager for a design agency. A local parent involved with several schools and sports clubs, Jacqueline has also built up a great understanding of sport and education in the area and is always looking for ways to make a positive difference across Bucks & MK. Jacqueline spends most of her time outside of work taxiing her two sporty teenagers and believes being active helps improve your mental health and recently trained as a Mental Health First Aider. 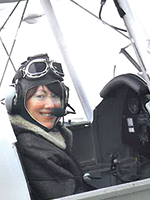 Her boys keep her active and enjoys new challenges; climbing Snowdon, learning to fly a Tiger Moth and Clubercise was recently added to the list!